Welcome back to my series on how to make your own delicious Thanksgiving Dinner, even if you’ve never done it before. If you’re just joining us, you can check out the first post, Getting Organized, which has all the links to the other posts, including how to roast your turkey and how to make gravy. This post is on a basic side dish that will get you lots of applause for minimal effort: Green Beans Amandine. Don’t be afraid of the fancy title. It’s just green beans sauteed with almonds. Let’s be real. Thanksgiving Dinner is not about healthy eating. That being said, one does want to at least nod at healthier options and a green veggie side will go a long ways toward that nod. It’s all about balance, right? The thing with Green Beans Amandine is that they sound fancy, but they’re really pretty basic. You can do the first step (the blanching) well ahead of T-day, then flip them in the pan with the butter while the turkey is resting from its bout with the oven. Try and get someone else to mash the potatoes. Or do the beans first, then mash the potatoes. Your call. You need only three ingredients: Green beans (figure about five or six beans per person), almonds ( about a tablespoon for four people) and butter (not more than a tablespoon for four people). Oh, and water and salt. The first part is easy (sort of), and this is the part you can do any time before Thanksgiving Day. Trim the icky bits off the beans (the stem ends and any bits that look black and nasty). Then put a good-sized pot of water on high heat. 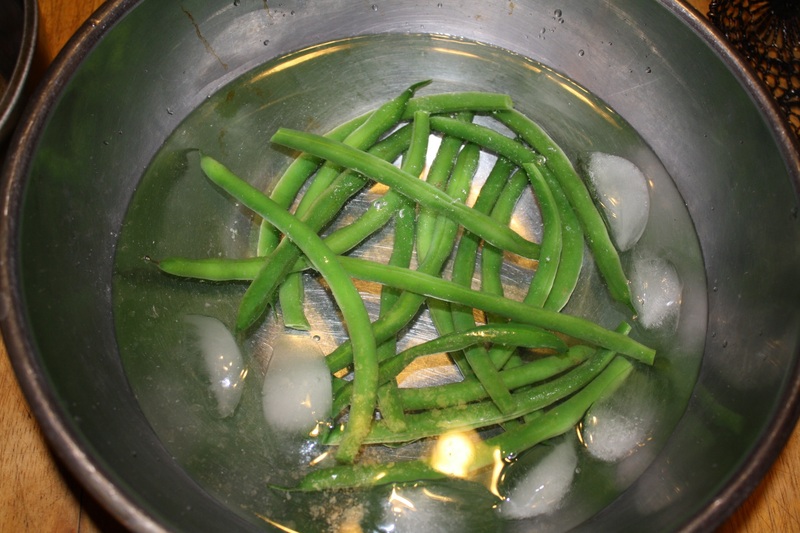 While you’re waiting for it to boil, set up a bowl big enough for all your beans, filling it with cold water and making sure you have some extra ice. 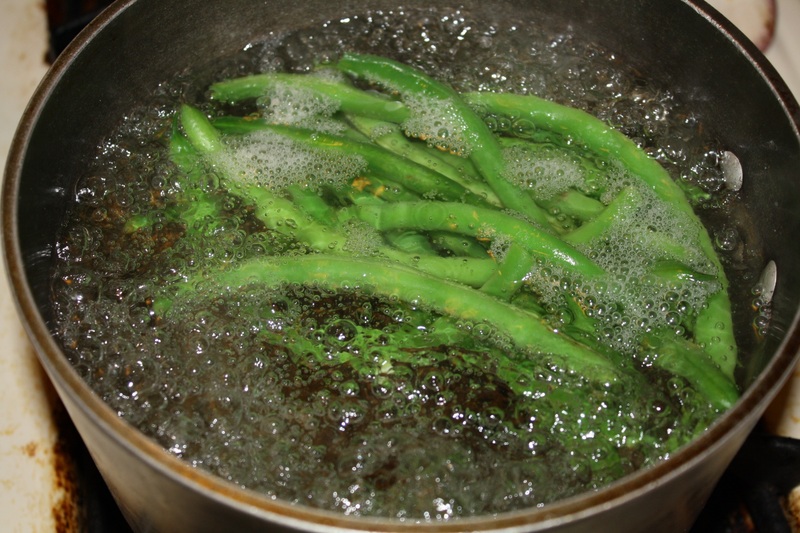 When the water in your pot is boiling, add the beans. Give the beans about three to five minutes. While they’re cooking, add the ice to the bowl you set up. And watch the beans. You want them looking really green and perky, not that drab greenish brown that tends to come out of cans. They can still be a little stiff, but if they’re more flexible than when they went in, you are golden. Once they’re at that point, pull them out of the hot water with a slotted spoon or a sieve and dump them into the ice water bowl. 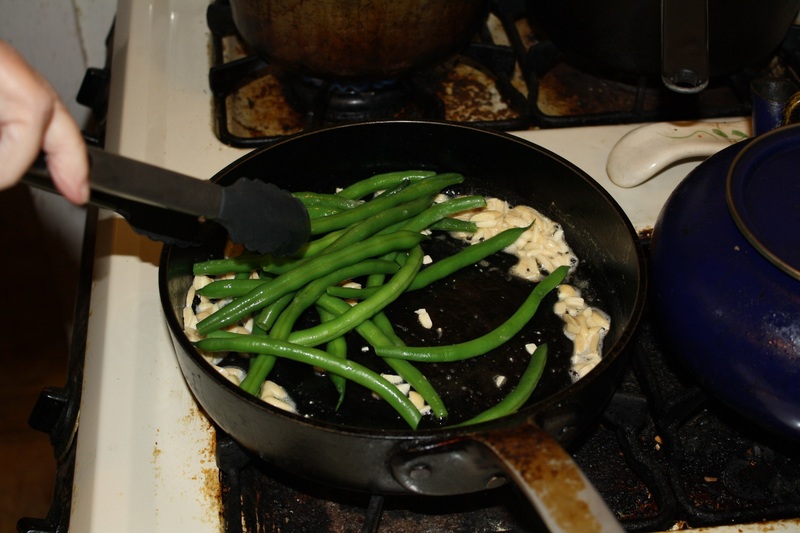 The idea is that you’re stopping the cooking right away so that the bean keep their pretty green color. Don’t worry if they’re still a little crispy. You’re going to be cooking them again, so you want them a tad undercooked here. So the big day has arrived. The turkey is out of the oven, the soup and the salad have been consumed, the potatoes await mashing. All you have to do is melt a tablespoon or more of butter in a frying pan over medium heat, then toss in some slivered almonds – maybe a tablespoon per four people eating. (Note – I overdid it on the almonds in the below pics.) Stir those around until they’re just starting to pick up a brown tinge, then add your beans. Give the beans a couple more stirs, add some salt, stir again, then turn the heat way down while you cut up your turkey, then mash your potatoes. Put everything into its proper serving container and serve. And that means pouring yourself a glass of wine and relaxing. The clean up will wait.